‘Orangutan’ is a name given to two species of great apes – the Bornean Orangutan (Pongo pygmaeus) & the Sumatran Orangutan (Pongo abelii). Both species are now critically endangered primarily as a result of habitat destruction. Although not as vocal as other great apes, orangutans make a variety of different sounds. 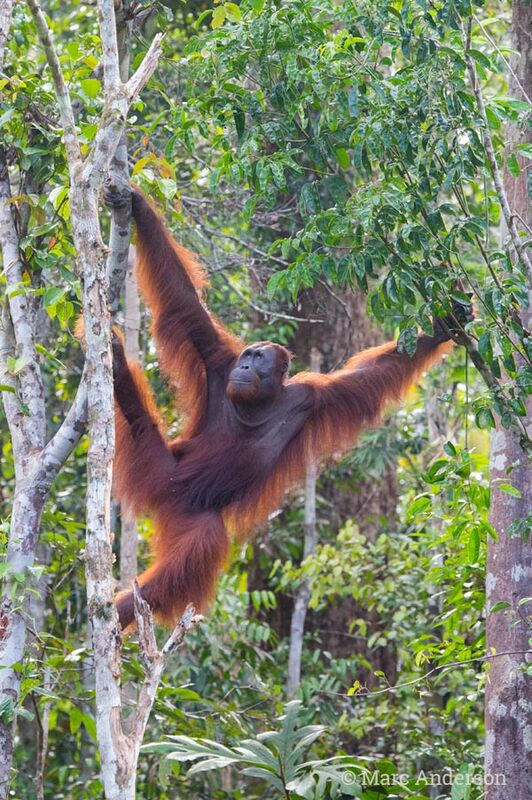 Adult male orangutans make what is referred to as a ‘long call‘, a sequence which usually starts with a few softer barking notes, then changes into a long series of heaving roars which gradually lower in frequency and taper off into bubbly drawn-out groans. It is thought these ‘long calls’ serve not only to attract females, but also to identify individuals and the context of the caller. It has been suggested that the directionality of this particular call-type is aided by the male’s cheek flanges. Also, adult males have a large air sac which acts as a resonator, enabling these deep, throaty sounds to carry long distances through the rainforest. Orangutans make other calls including a ‘kiss squeak‘ when agitated, a ‘raspberry‘ during nest building and infants sometimes make a soft hooting call. Both males and females can make rolling, guttural sounds when threatening another individual. DVO1 This first recording is an example of a typical ‘long call’ of an adult male Bornean Orangutan. This sample was recorded at around 4am in the Danum Valley, Sabah, Malaysia. DVO2 A longer variation of the ‘long call’ with more single barking notes at the beginning. This is the same male as in the first sample, recorded about 30 minutes earlier at around 3:30am. DVO3 This is an example of the ‘kiss squeak’ – a sound both male and female orangutans make when agitated. In this case, an adult male was observed by a group of hikers in the forest close to a trail – the people were obviously too close to the orangutan and it began to move away while making these sharp squeaking noises. Recorded in the Danum Valley, Sabah, Malaysia. DVO4 This next example is a ‘long call’ series which was given shortly after the ‘kiss squeak’ calls heard in the previous example. This individual was evidently agitated which may be reflected in the pitch and intensity of this particular call sequence. Recorded in the Danum Valley, Sabah, Malaysia. 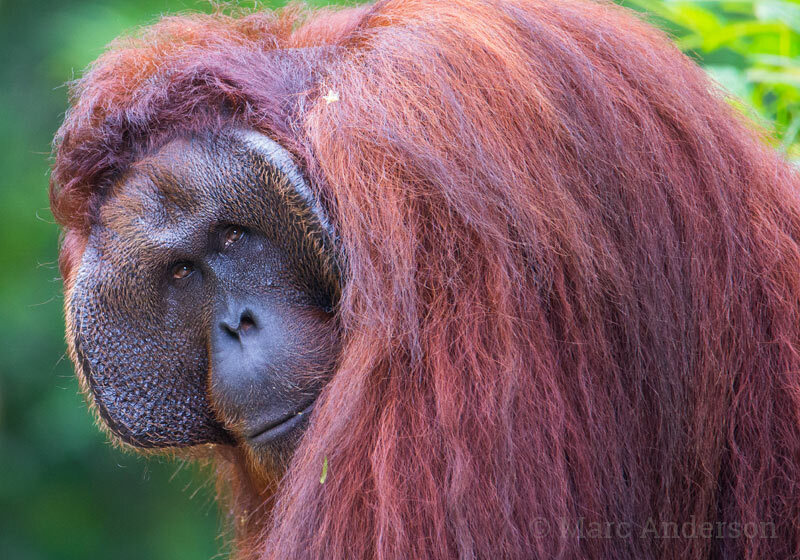 Adult male Bornean orangutan (Pongo pygmaeus) with large cheek flanges. It is thought these facial structures help directionalize vocalisations.